Leicester manager Nigel Pearson warned his side they still "have a long way to go" to secure their Premier League survival after beating Swansea 2-0. Goals from Leonardo Ulloa and Andy King gave the Foxes a third league win in a row and moved them off the bottom for the first time since November. Leicester remain in the relegation zone, but only on goal difference. "The danger is people start believing the job is done," said Pearson. "It is far from it." The Foxes travel to bottom side Burnley next Saturday, with games against fellow strugglers Sunderland and QPR to come. 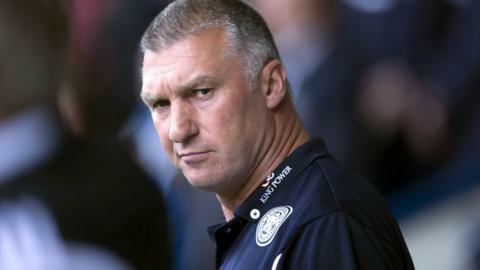 Four of their remaining six games are at home, which Pearson believes could be important for his side. "To get three wins on trot in this division is very hard and doubly so considering the position we are in," he added. "We are delighted. "We have still got six games left and we have to get as many points as possible from them, which is going to be a big challenge. "Our fate is still in our hands, which is how we want to keep it for as long as possible."